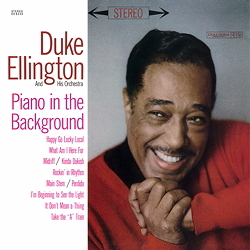 "Piano In The Background" - Duke Ellington (p); Johnny Hodges, Harry Carney, Russell Procope (sax); Ray Nance, Willie Cook (tp); Lawrence Brown, 'Booty' Wood (tb); Aaron Bell (b); Sam Woodyard (dr); a.o. ﻿Big band fans, take note! These nine numbers, in precisely this version, belong in every collection. We are talking about the year 1960, and the 17 musicians involved have probably performed this very repertoire every night in a different venue all over the globe. But in the studio it all sounds fresh and new, well practised but never dull, cool, groovy and intoxicating. The difference to a great number of other Ellington LPs is that here not a single wind soloist stands in the foreground but the whole body of musicians. The arrangements are all new and some of them are even quite unusual, but Sam Woodyard on the drums has everything well under control - sometimes not at all 'Ellington-like'. Snapping the fingers is automatic, and tapping your foot is also not to be frowned on; however this recording demands careful listening! If you have the first version of these numbers in your collection then it would be a good idea to compare them with this recording. The Duke Ellington Orchestra remains young, dynamic and varied thanks to a continually changing ensemble. And the 'Piano Man', as the best 'pause-filling' pianist ironically called himself, sat full of vigour before the 88 keys of the keyboard at the age of 60. Not only jazz fans will be saying a big thank you that this recording - made in the early days of stereophony - is available once again on virgin vinyl with superb sound.